Across the commercial installation spectrum there is a rising expectation for higher-quality systems with higher fidelity. It’s an undeniable trend, according to Andrew Rutkin, Extron Electronics’ product marketing manager of audio product and speakers. “Across the board, from background music to paging, people expect better sound,” he explained. Rutkin says that the revolution is occurring in every place the public gathers. New developments in design and technology are giving systems contractors incentives to install ceiling speakers in previously inaccessible spaces, with absolutely no compromise in quality. Manufacturers like QSC, Extron, Community Professional Loudspeakers, Speco Technologies, and Atlas Sound, are blazing the trail with Good, Better, Best lineups that cover every base for installers, and may even help open new business opportunities. Arguably, the most convincing element of an integrated AV experience is the sound. Psychoacousticians and scientists have devoted more years and white papers than we can count to understanding the mysteries of sound. But what we all agree on is that while video tells us what to believe (seeing is believing), audio tells us how to feel. It’s critical to get the sound precise— think of how muting a horror film or a romantic comedy strips it of its emotional punch. Specifically in a surround-sound environment, audio information piping out from every direction literally immerses the listener. A successful ceiling audio system provides greater dispersion, realism, tonality, and drama to a soundtrack, making it seem more believable and enjoyable. The three-dimensional quality of ceiling speakers catapults the audience right into the middle of the action. Growing market demand for better quality, more engaging installations proves that consumer habits are changing, even if the experience itself is sometimes subliminal, Community’s John Wiggins said. And Wiggins should know. He serves as the vice president of Community, based in Chester, PA. His company, which is celebrating its 40th anniversary at InfoComm, sells large volumes of ceiling speakers to leading retail, food and beverage, and hospitality clients that prefer a superior performance. And everyone can hear the difference. For the modern retailer looking to distinguish itself among its competitors, quality is a reasonable method. Cafes are starting to offer the same sonic amenities as resorts, and every consumer-oriented space wants to exceed customers’ expectations with improved sound quality, reliability, and extended bass. Considerations when specifying a ceiling speaker are numerous. How can you install multiple speakers in a hotel lobby or classroom and still make them look discreet? Moving a speaker just an inch can impact overall sound, so proper speaker placement is important. Also the room’s natural acoustics and shape, as well as its furniture, will affect the music or dialogue. In a listening room, carpet and furnishings must be carefully considered; in a shared or multi-purpose space, those factors could be lethal to audio. Too many bare walls and hard surfaces will bounce sound around like a pingpong ball. Those reflections will add a noticeable severity to music. Grand hotel ballrooms with thick drapes or heavy carpet will help facilitate absorption. Community is using the InfoComm stage to launch its new Forecaster software tool for calculating the number of speakers required for applications. “Contractors were asking for a more accurate calculator and this is it. It’s the real thing,” Wiggins said. The software is available via communitypro.com or by calling the company. 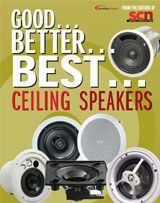 When selecting ceiling speakers, according to Atlas Sound’s Steve Young, in the “Good” category, it is important to look for durability, but in the Better and Best category it’s all about sounding as good as possible with total reliability. Similarly, it’s also about offering contractors a supremely easy install. That cumulative effect of versatility, reliability, and fidelity is the value proposition for Atlas Sound dealers, Young explained. “We are becoming the de facto standard in bars and restaurants in new malls,” he said. Extron is another manufacturer with an impressive array of ceiling products. At InfoComm in Las Vegas, Extron will showcase four ceiling-mountable audio products with one new variation, the SI3cLP. The new model has eliminated the prior unit’s transformer, which, according to Rutkin, reduces cost, making it more appropriate for smaller rooms. “It’s a significant cost decrease,” he said. Another aspect of the ceiling speaker value proposition for Extron is potential profitability. By creating an easy-to-install ceiling speaker, the contractor can decrease the amount of coordination with other trades on the job site. Install-friendly units can be integrated under air-conditioning or heating ducts and piping with less worry about other trades, which “saves time and money,” Rutkin added. Extron’s System Integrator speakers are all designed in-house to achieve a consistent sound throughout the series. The team works hard to create speakers that sound great for music as well as speech, documentaries or a high-voltage rock show, handling peaks in the intelligibility range while offering neutrality. So for a music class or a music history class, the sound is natural. A multi-component crossover in Extron’s SI 26X two-way coaxial model provides a smooth transition between low and high frequency transducers. Another big contributor to Extron’s value advantage, Rutkin believes, is that all of the models in their Systems Contactor line offer flat frequency and broader dispersion, which helps the integrator in the field. “The job is easier because he is starting with a complete product— there is no time wasted equalizing and tweaking the speaker on the site,” he added. Speco Technologies' Scott Pisani understands that "value" means more than just saving money. For the folks at Speco, the value proposition of their ceiling speakers, including the high-end SP-6CLC, is the winning recipe of style, stealth, performance, and competitive pricing. "You can't get a better looking speaker for the price that you are paying," Pisani said. The addition of the curved molding makes the Ceila quite an extra-ordinary product: "They look a little more artistic, not flat," he elaborated. "The sound is fantastic and the availability of the center channel in-wall and the sub in-wall make for a complete lineup." Speco Technologies' Ciela Surround Series speakers, which have been shipping for under a year, replaced Classic Series. Notable talking points for the Ceila include injection-designed woofers and the ever-popular pivoting titanium dome tweeter for a more customized listening experience. QSC’s AcousticDesign products are marketdriven, not born in the sterile lab, he adds. Any manufacturer that is successful must go this route, by responding to market changes with products that meet contractors’ needs. The AcousticDesign models are ideally suited for anywhere a ceiling speaker is needed, with the bonus of high fidelity. The Good, Better, Best offerings from these leading manufacturers complements the evergrowing range of applications, from conference rooms to hotel lobbies. Where discretion is appreciated but quality is expected, contractors now have more choices than ever before. Margot Douaihy is a contributing editor for Residential Systems magazine. SPECIAL FEATURES - The Extron System INTEGRATOR® SI 26X ceiling speaker is a two-way coaxial design with an open back for use in non-plenum airspace environments. Wide dispersion and an aimable, pivoting dome tweeter make it a good choice for low ceiling applications. A sophisticated, multi-component crossover provides a smooth transition between low and high frequency transducers. Music reproduction is enhanced by the exceptional low-frequency response of the long-throw woofer, which is specifically designed for infinite baffle environments. The SI 26X is ideally suited for overhead distributed audio applications for music and voice. SPECIAL FEATURES - The Extron System INTEGRATOR® SI 3CT LP is a full-range ceiling speaker featuring a 4-inch deep metal back can. It is designed for low ceiling installations, especially those with clearance issues such as air handling units installed close above the ceiling. The 3-inch driver and conical baffle provide 170-degree dispersion with minimal beaming directly under the speaker. The SI 3CT LP is UL 2043 listed for use in plenum ceilings and features a behind-the-grille power selector switch for direct 8-ohm operation as well as 16-, 8-, 4-, 2-, and 1-watt settings for 70-volt operation. Also available without a 70-volt transformer as the SI 3C LP. SPECIAL FEATURES - The Extron System INTEGRATOR® SI 26CT is a high power, two-way ceiling speaker featuring an 8-inch deep metal back can for installation in plenum airspace environments. Voice reproduction is natural and clear while music reproduction is enhanced by the pivoting tweeter, longthrow woofer, and tuned bass port. The SI 26CT is at home in high-powered, high-ceiling distributed audio applications requiring UL 2043 listed plenum-rated ceiling speakers. The SI 26CT features a behind-the-grille power selector switch for direct 16-ohm operation as well as 60-, 30-, 15-, and 7.5-watt settings for 70-volt operation. SPECIAL FEATURES - Strategy Series II 4” Ceiling Speaker System provides high performance in a compact footprint. The FAP 40T appeals to both system designers and architects and is ideal for high-intelligibility voice, music, and signal reproduction in commercial, industrial, and institutional applications..
SPECIAL FEATURES - Strategy Series II 6” Coaxial Tuned & Ported Ceiling System is a coaxial ceiling speaker perfectly suited for business music and public address applications. The compact enclosures and wide dispersion pattern make the FAP 62T a perfect choice for low ceilings especially where high fidelity sound reproduction in an attractive and easy-to-install system is required. SPECIAL FEATURES - Strategy Series II 2-Way True Compression Driver Coaxial Speaker System with 60 watt 70.7V/100V Transformer, a true compression driver with premium performance. A 70.7/100V tuned and ported 8-inch coaxial ceiling speaker system perfectly suited for many business music and public address applications especially where high ceilings require loudspeakers with increased efficiency and tighter pattern control. SPECIAL FEATURES - Large port area for extended low-frequency performance. Defeatable passive 120 Hz low-pass filter with impedance compensation. 100 watts continuous power handling, 400 watts peak. 70/100 V multitap transformer with 8-ohm bypass. Cring and tile rails included, side cable entry. SPECIAL FEATURES - Wide-bandwidth, high-fidelity performance ensures a full, rich sound with low distortion. Shares driver technology with AD-S surface mount loud speakers to provide the ability to mix speaker models within zones for the best possible coverage. True high-fidelity, 2-way design speakers feature a 1-inch titanium HF dome tweeter for exceptional sound quality..
SPECIAL FEATURES - Wide-bandwidth, high-fidelity performance ensures a full, rich sound with low distortion. Shares driver technology with AD-S surface mount loudspeakers to pro vide the ability to mix speaer models within zones for the best possible coverage. True high-fidelity, 2-way design speakers feature a 1-inch titanium HF dome tweeter for exceptional sound quality. DRIVER/CONE SIZE - 4" / 0.75"
SPECIAL FEATURES - The AcousticDesign Series of installation loud speaker products from QSC Audio expands with the new AD-C42T ceiling mount loudspeaker system. Designed for back ground and general-purpose audio play back, the new AD-C42T is compact and acousticall matched to the entire AD Series. SPECIAL FEATURES - CLOUD4 is designed for optimum performance and consistent coverage with minimal diameter. Operational in both 16 ohm and 70V formats, the woofer and high output co-axially mounted 3/4-inch tweeter will deliver high quality sound over a wide coverage area. The CLOUD4 is a complete self-contained, coaxial, bass-reflex system featuring all-metal construction. SPECIAL FEATURES - CLOUD6 is engineered with all the unique feature’s of Community’s Cloud4, but includes a larger 6-inch diameter LF driver and larger volume drawn steel back enclosure for room-filling solid bass performance. Typical CLOUD6 applications include high end full range music playback and paging systems for nightclubs, retail environments, restaurants, and HOWs requiring superior performance and quality. SPECIAL FEATURES - CLOUD12 is a full-range coaxial ceiling loudspeaker featuring an enhanced frequency dividing network for optimal off-axis clarity and intelligibility, and a new lower profile design that allows for greater flexibility in mounting. CLOUD12 features Community’s DYNA-TECH protection circuitry, FerroFluid-cooled drivers, and bulletproof design. Community manufacturers the industry’s finest matching backboxes and mounting accessories. CLOUD12 is available in 60x60 and 90x90 dispersion models. For applications requiring greater LF output, the CLOUD 12 can be combined with the CLOUD12SUB subwoofer system. SPECIAL FEATURES - Speco Technologies Custom Builder Series speakers are the perfect combination of performance and value. Designed to continue Speco Technologies’ rich history of audio innovation, the Custom Builder Series speakers have been created specifically for today’s listening environments and lifestyles. Whether using these speakers in the home or in the office, the Custom Builder Series speakers will provide performance and reliability at an attractive price. Sold in pairs. SPECIAL FEATURES - Speco Technologies has leveraged over 40 years of residential sound expertise in developing our core Series 25 inceiling audio line. Manufactured from durable, quality components, these speakers provide strong value. Enjoy the premium performance of full-range sound in your listening environment for countless years to come. Sold in pairs. SPECIAL FEATURES - Speco Technologies’ high-end Ciela Surround Series speakers offer harmonized engineering where each speaker was developed to provide the ultimate listening experience when played in concert. The pivoting titanium dome tweeters focus the high frequencies to your customized listening area. The injection-designed woofers with rubber surround deliver powerful, rich low frequency responses with minimal distortion.